Surely, you’ve been to Geneva. You’ve probably flown to the international airport for a cheap connection elsewhere in Europe. Or you’ve transferred to Gare de Cornavin to catch a train to Paris or Milan. Or maybe you’ve even rented a car to drive to the Alps—Swiss, French, or Italian. But have you ever stopped to actually explore Switzerland’s largest French-speaking city? You should. Geneva sits along Lake Geneva in southwest Switzerland. Originally an independent republic, the city was claimed by both Switzerland and France, before officially becoming Swiss after the Napoleonic Wars. It’s now considered a global city, since financial institutions, international companies, diplomats, agencies of the United Nations, and the Red Cross call the “Peace Capital” home. It’s always included on the list of the most expensive cities in the world. While it’s known for its watchmaking, chocolate, knives, and stunning scenery. 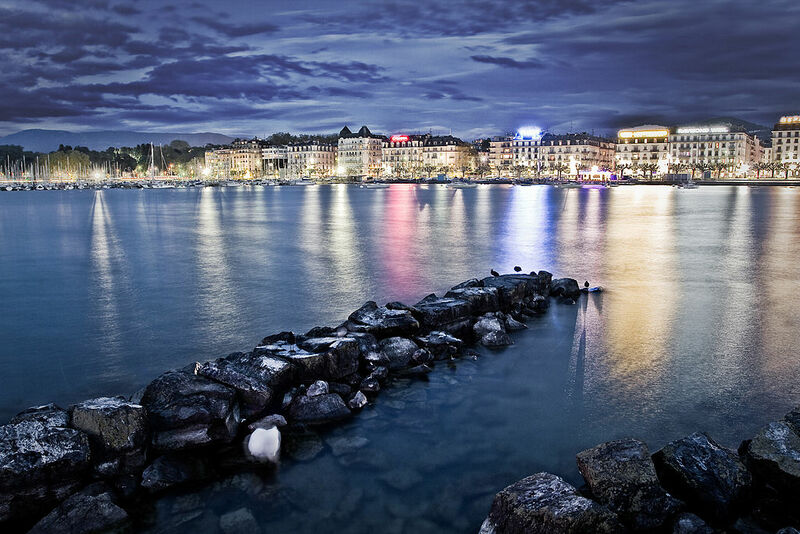 Your mornings in Geneva should start along the lakefront. Run through Parc Mon Repos and down Quai Wilson. Or grab a cup of coffee and a warm croissant and walk along Quai du Mont-Blanc. Either way, you pass grand hotels, excited dogs, people feeding ducks, and covered boats docked at the jetties. Frost may have formed along the edges of the lake overnight, but it’s quickly thawing under the bright sun. 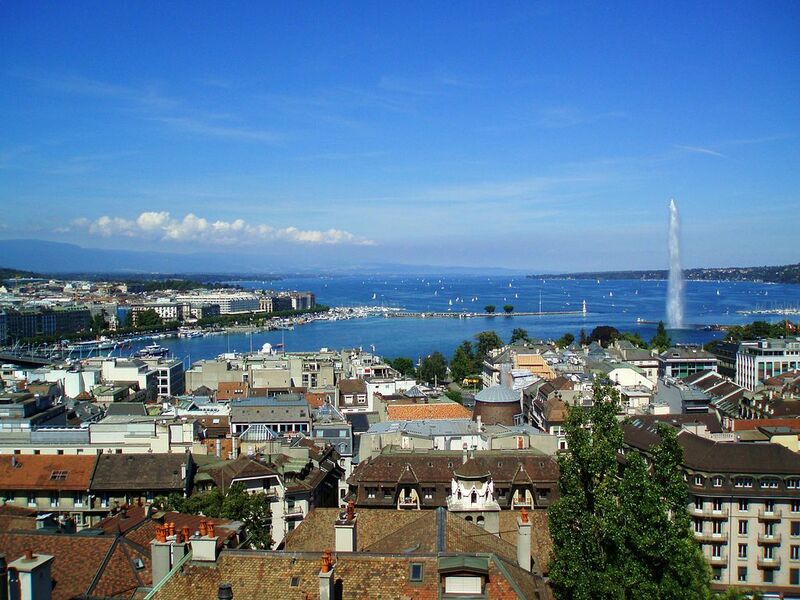 You soon have a perfect view of the Jet d’Eau, a fountain that pushes water more than 450 feet into the air. Snowcapped Mont Blanc looms in the background. Cross Pont du Mont-Blanc, a bridge that passes over the Rhône, connecting the right and left banks of the city. Wander through Jardin Anglais, a waterfront park with a huge flower clock and a sculpted bronze water fountain. Stop at Chez Lucien along the water for lunch—a Léontine salad or a Campagnard club sandwich—and a glass of Petite Arvine. The white wine, from the nearby Valais region, is rarely exported outside of Switzerland. Then head up the steep hill to Vieille Ville. The Old Town has cobbled streets, winding alleyways, and gorgeous views of the lake. See St. Pierre Cathedral. The Romanesque- and Gothic-style church was originally Catholic before converting to Reformed Protestantism. It’s home to a museum, an underground archaeological tour, and a tower with a view over the entire city. City Hall stands across the courtyard from the cathedral. Five cannons are still ready to defend the city. While nearby Bastions Park is full of trees, statues, and the Reformation Wall memorial. After browsing the antique stores and the chocolate shops, you’re ready to eat. Restaurant Les Armures is welcoming with wooden beams, photos of their famous guests, and extended families eating dinner. Order the fondue with either herbs or mushrooms. The large pot arrives bubbling and smelling delicious. Despite a valiant attempt, there’s no possible way to finish the cheesy dish. Luckily, you have to walk back down the hill and along the waterfront to return to your hotel. The city, whose lights reflect off the lake, is even more beautiful at night than it was during the day. You’re so glad you really, finally, came to Geneva.